(Nanowerk News) Light-emitting diodes are gaining ground: They are now being used as background lighting for displays. But the manufacturing of complex LED optics is still complex and expensive. A new technology is revolutionizing production: Large-scale LED components can now be manufactured cost-effectively. Television screens are becoming increasingly flatter - some have even become almost as thin as a sheet of paper. Their size takes impressive dimensions, much to the delight of home cinema fans. Cellphones and laptops also have ever brighter and more brilliant displays. All of these developments owe their thanks to miniature light-emitting diodes – LEDs – that beam background lighting into a multitude of devices. The superficial structures of this sheet are only a few micrometers in size. However, LED technology does have a disadvantage. It is a point light source. But displays are two-dimensional. So how does one distribute the light from an LED evenly on as large a surface as possible, without massive energy loss? At the Fraunhofer Institute for Production Technology IPT in Aachen, a truly one-of-a-kind machine is currently emerging. They will soon be producing fiber optic film that solves this problem and distributes the light two-dimensionally. What‘s so unusual and special about this: The films possess superficial structures measuring in the single-digit micrometer range, while the sheets themselves measure at two by one meter in size. This makes them the largest of their kind throughout the EU. In addition, they can be produced cost-effectively and with energy-efficiency in mass reproduction. To do so, the researchers of IPT developed a process chain with which they can populate large-scale sheets with the necessary microstructures. »It‘s an ultraprecise process,« says Dr. Christian Wenzel, senior engineer at IPT. Using pinpoint accuracy, the machine must apply the smallest structures – just a few micrometers in size – onto the surface of the film in a periodic sequence. »In order to produce the stamp, we use special diamond tools,« explains Wenzel. The stamp consists of a gossamer-thin nickel sheet, and itself is also infinitesimal: Its surface equals at most two by two millimeters. Like a dot matrix printer, it must then process a sheet measuring two by one meter in size, guided by the ultraprecision machine. »Within a few days, we completely structured the entire surface. With the previous approach, the process would have taken weeks, or even months,« says Wenzel. 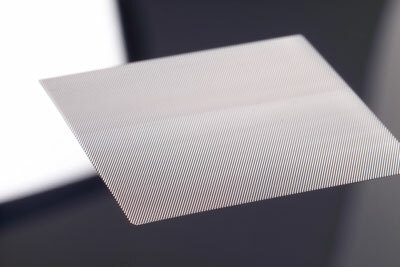 The preliminary product is the master: a transparent and optically conductive plastic panel. In order to determine if the microstructured master possesses the desired characteristics, it must first be tested based on a few parameters. »The machine can accomplish this task as well,« says Wenzel. If the approximately 80 percent of the surface is completely structured, the machine tests the properties of the sheet. If these properties are not consistent with the optical design settings, then the machine can implement the necessary corrections during the imprint process. »Well, we are optimizing the component while it‘s still in the machine,« as Wenzel explains the advantages. Once the plastic surface has the desired light control capabilities, then the engineers immerse the master into a nickel bath and galvanize it. The nickel shim created in this manner can then go into mass replication. »With our ultraprecise machine, we are capable of producing an entire array of systems with background lighting,« says Wenzel. No matter if it‘s for displays, architectural lighting or a car‘s interior lighting: IPT researchers can implement almost any optical design, thanks to this machine, and adapt the machine technology – reliably, and above all, efficiently. In other words: ready for mass production.